Asgarpanah, J., Darabi-Mahboub, E., Mahboubi, A., Mehrab, R., Hakemivala, M. (2013). In-Vitro Evaluation of Crocus Sativus L. Petals and Stamens as Natural Antibacterial Agents Against Food-Borne Bacterial Strains. Iranian Journal of Pharmaceutical Sciences, 9(4), 69-82. Jinous Asgarpanah; Elahe Darabi-Mahboub; Arash Mahboubi; Rezvan Mehrab; Mojdeh Hakemivala. "In-Vitro Evaluation of Crocus Sativus L. Petals and Stamens as Natural Antibacterial Agents Against Food-Borne Bacterial Strains". 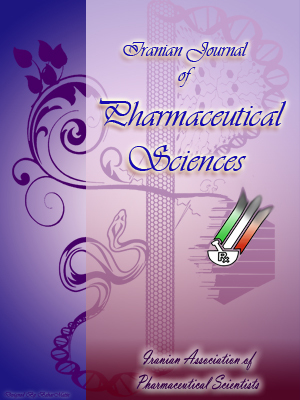 Iranian Journal of Pharmaceutical Sciences, 9, 4, 2013, 69-82. Asgarpanah, J., Darabi-Mahboub, E., Mahboubi, A., Mehrab, R., Hakemivala, M. (2013). 'In-Vitro Evaluation of Crocus Sativus L. Petals and Stamens as Natural Antibacterial Agents Against Food-Borne Bacterial Strains', Iranian Journal of Pharmaceutical Sciences, 9(4), pp. 69-82. Asgarpanah, J., Darabi-Mahboub, E., Mahboubi, A., Mehrab, R., Hakemivala, M. In-Vitro Evaluation of Crocus Sativus L. Petals and Stamens as Natural Antibacterial Agents Against Food-Borne Bacterial Strains. Iranian Journal of Pharmaceutical Sciences, 2013; 9(4): 69-82. 1Department of Pharmacognosy, Pharmaceutical Sciences Branch, Islamic Azad University (IAU), Tehran, Iran. 2Department of Pharmaceutics, School of Pharmacy, Shahid Beheshti University of Medical Sciences, Tehran, Iran. 3Department of Microbiology, Faculty of Medicine, Shahid Beheshti University of Medical Sciences, Tehran, Iran. Growing interest to use natural preservatives and spices with antimicrobial effects and large amounts of floral bio-residues (92.6 g per 100 g) generated and wasted in the production of saffron spice guided this study to evaluate the opportunity to expand the uses of C. sativus flowers (petals and stamens), beyond the spice (dried stigmas). The antibacterial potential of total extracts and different sub-fractions of floral bio-residues of saffron production (petals and stamens) were primarily evaluated against five bacterial strains potentially causing food-borne disease (Bacillus cereus, Staphylococcus aureus, Salmonella enterica, Escherichia coli and Shigella dysenteriae) using well diffusion method. The minimum inhibitory concentration (MIC) and minimum bactericidal concentration (MBC) values were determined by macrodilution method. Methanol extract of petals had shown more antibacterial activity against S. aureus, S. enteric, and S. dysenteriae compared to stigma. Methanol extract and ethyl acetate sub-fraction of stamens showed more antimicrobial effect against B. cereus and E. coli. The petals total extract showed the most antibacterial activity against Shigella dysenteriae (MIC 15.6mg/ml) while the ethyl acetate and chloroform sub fractions showed the maximum effect against Bacillus cereus(MIC 62.5mg/ml). Stamen methanol total extract and aqueous sub fraction have the maximum effect against Staphylococcus aureus and Bacillus cereus (MIC 62.5mg/ml) while the ethyl acetate sub fraction has the best effect against Shigella dysenteriae (MIC 15.6mg/ml). Results showed that both petals and stamens could act as new and natural sources of antibacterial agents with food industrial applications.